Prominent & Leading Manufacturer from Ahmedabad, we offer modular operation room. Modular Operating Theater System consist of Air filtration system consisting of HEPA filters Plenum (laminar Air flow), PUFF wall panels, ceiling panels, interior doors and windows. The System is designed for operating Theater , treatment rooms and rooms in which high sanitary and hygienic standards are required. 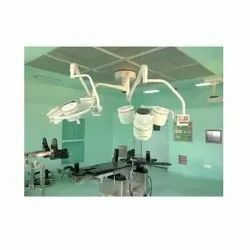 Techpanacea’s Airmagik - Modular OT has rich experience of in designing and fabrication more than 120 World Class Modular Operation Theater across India. Modular OT offers the advantage of speedy construction, high-quality finishes in a prevention of contamination build up, long durability, robust and flexibility design for future expansion, ease of maintenance etc. The pre-engineered modular Operation Theater solves the problem of infections.